Published on Saturday, April 21, 2012. 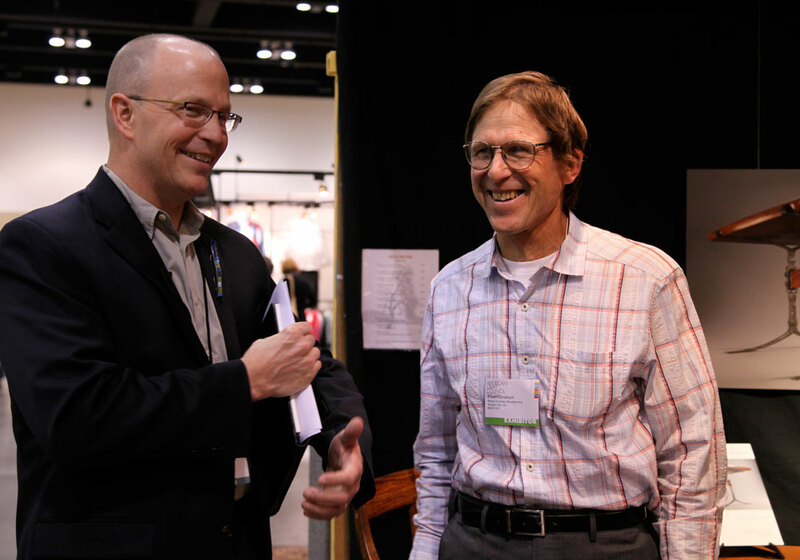 ACC executive director Chris Amundsen surprises Robert Erickson in his booth with an award of excellence. It's one of the best moments of every American Craft Council show: the presentation of the awards of excellence on the first day. 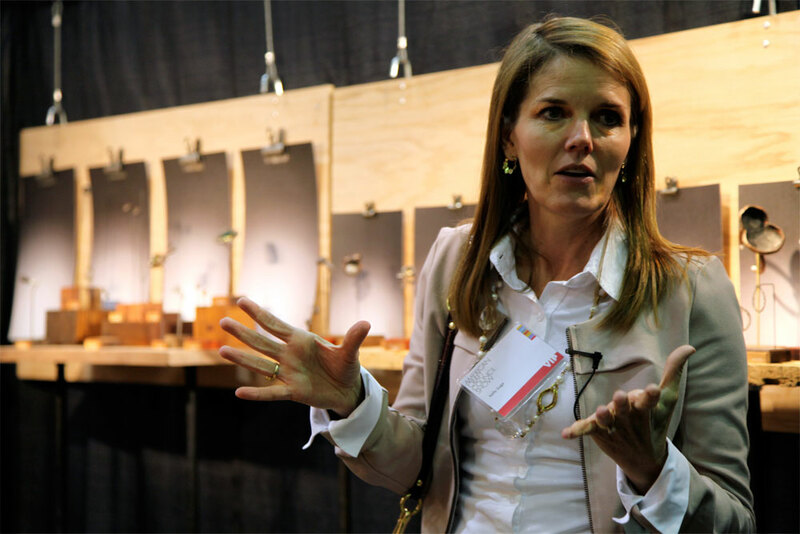 This year, two jewelry makers, a furniture maker, and a metalsmith were honored. The juror was Kelly Gage, assistant professor of apparel design at St. Catherine University. 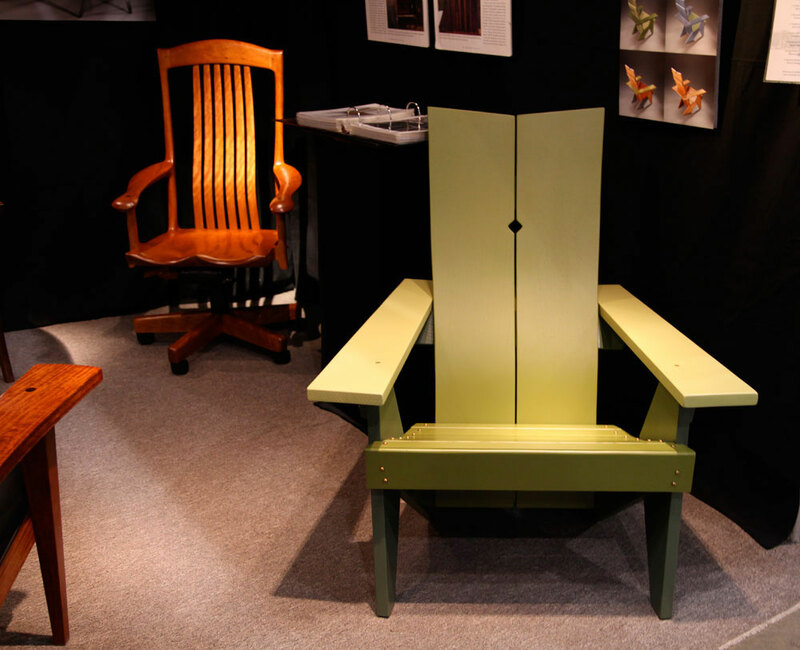 Robert Erickson, a Nevada City, California, woodworker who said he's been in the St. Paul show every year since its inception in 1986, was recognized for his furniture pieces, which range from classic rockers to contemporary Adirondack chairs. Gage said she loved the look of Erickson's chairs but decided "I should probably sit in them" before choosing him as a winner. Sitting clinched her choice. The chair backs are so well designed, "it felt like I was floating back, resting on a cushion," she said. Tai Kim, an Edison, New Jersey, jewelry maker who works with his wife, Tiara, was also honored. 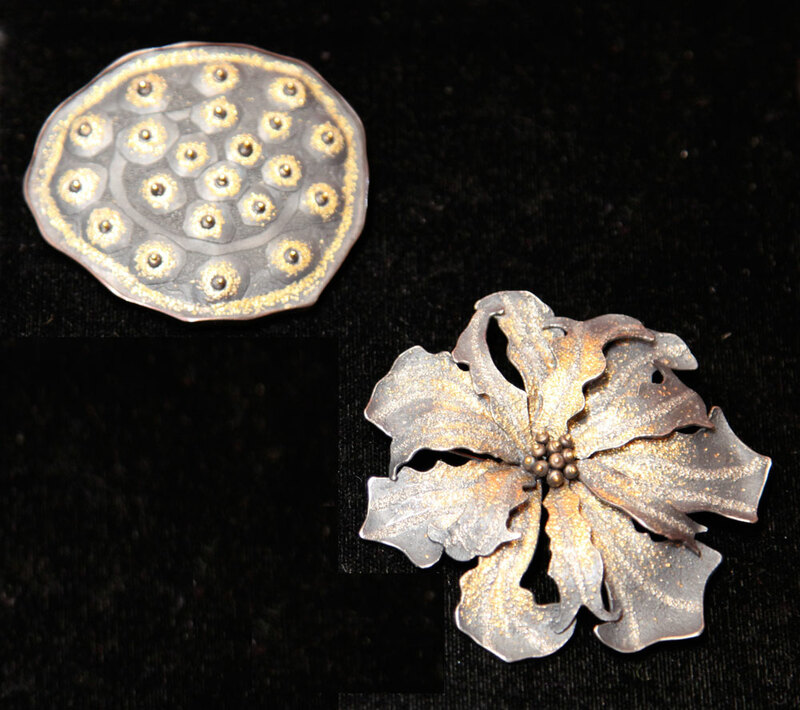 Gage praised the "organic aspects" of Kim's brooches, pendants, and earrings. Tiara said her husband had driven all night to get to the show so she had urged him to spend the day resting at the hotel. She said she was grateful to win, but sorry her husband missed the presentation of the award. 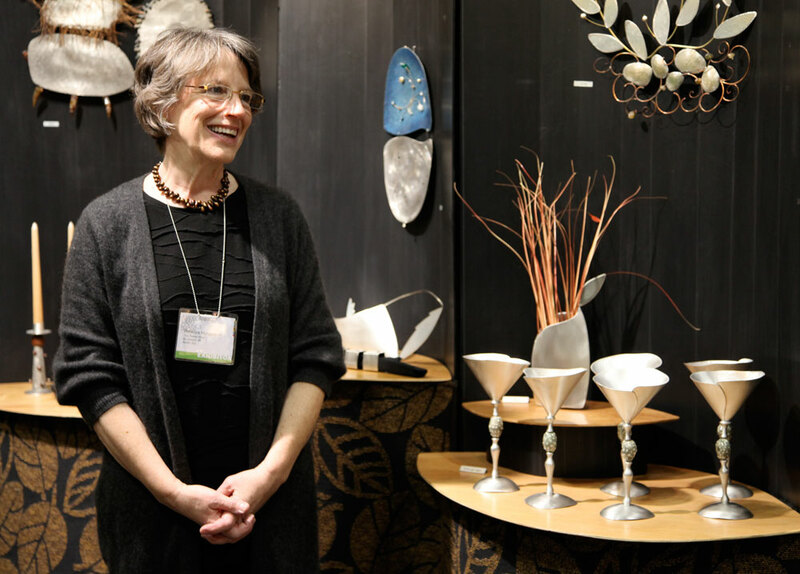 Rebecca Hungerford, a St. Joseph, Michigan, metalsmith who has worked with pewter for 36 years, won for her tableware and sculpture. 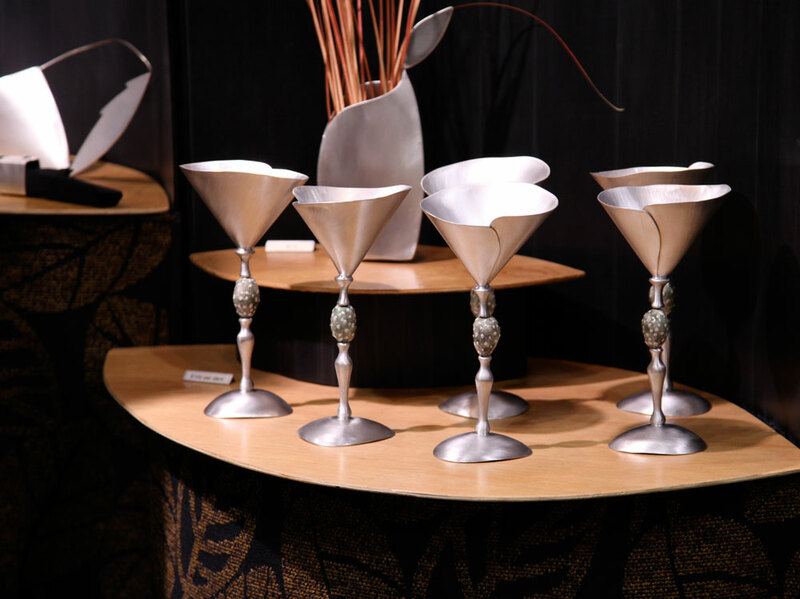 Gage said her husband lured her into Hungerford's booth during Thursday night's preview party; "he's kind of a martini guy," she said, and he loved Hungerford's barware. Hungerford's pieces are absolutely utilitarian, Gage said, "but they really are art objects that can be displayed in your house." 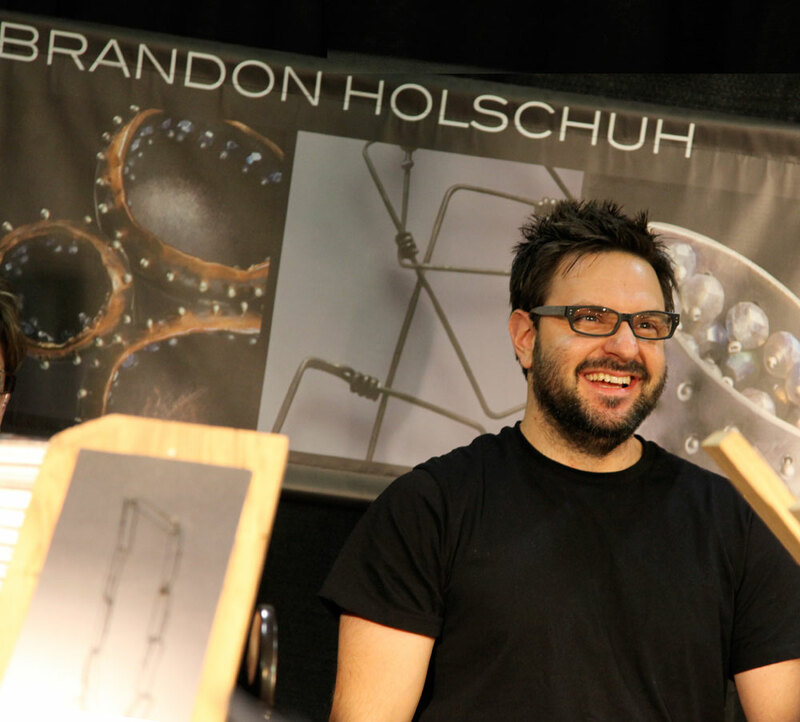 New St. Paul artist Brandon Holschuh of Concord Township, Ohio, won for booth design. Gage cited Holschuh's use of gradated backgrounds to highlight his jewelry, which is mostly dark in tone. 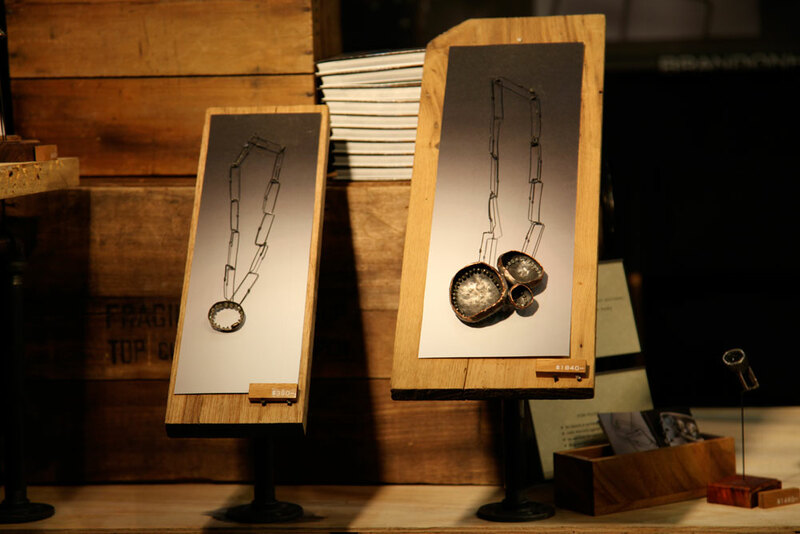 Holschuh not only makes jewelry but also crafts a stand for each piece, so his work is both wearable and sculptural. Holschuh said the award affirmed his approach: "I think presentation is as important as the work." 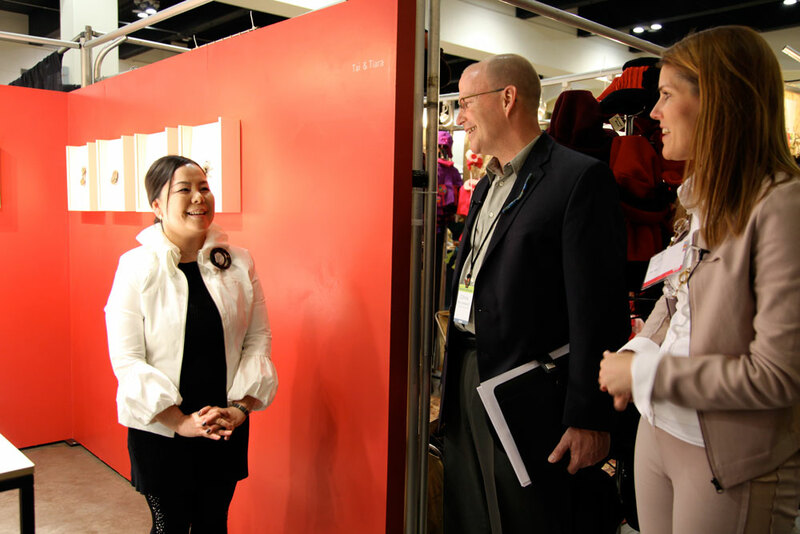 Award of excellence honorees receive $500 cash prizes and automatic acceptance into next year's St. Paul show. Tiara Kim accepts an award from Chris Amundsen and Kelly Gage.